Website speed is crucial for developing the best user experience possible, because, well, no one likes to wait for web pages to load. A public CDN is a web service that hosts and serves open source projects used for web development (e.g. jQuery, AngularJS, and Bootstrap). Public CDNs allow websites to use their services for free. Here are the best public CDNs for web development. With over 1,000 open source projects hosted on jsDelivr, it’s currently one of your most comprehensive options. jsDelivr relies on a couple of reputable CDN companies — CloudFront as the primary and MaxCDN as the failover — which ensures great service uptimes. jsDelivr is an open source project. Another extensive public CDN is cdnjs, which has a little over 900 open source resources conveniently listed all in one page. Tip: See their list of plugins and extensions on GitHub to find useful tools related to the service — for example, there’s CDNJS for WordPress, a plugin for quickly implementing cdnjs-hosted projects on WP sites. Many people outside of the ASP.NET development community don’t know that Microsoft has a public CDN. 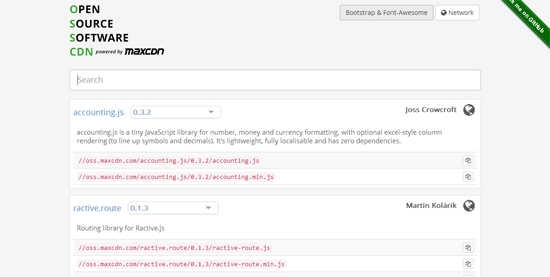 Among the open source projects on Microsoft’s Ajax CDN are jQuery, Bootstrap, and Respond.js. Compared to your other choices, Microsoft’s list of available open source projects is sparse, but what you do get is the peace of mind that comes from using a service maintained by a well-established, 39-year-old tech company. 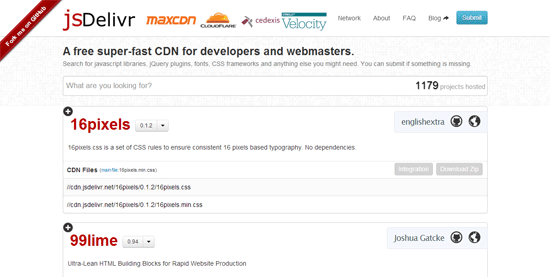 This CDN is an open source project by MaxCDN and is powered by jsDelivr. The difference between OSSCDN and jsDelivr, besides the user interface and project ownership, is that MaxCDN, which is jsDelivr’s failover/backup CDN, is the primary content delivery network. Some open source projects have their own CDNs. Here’s a couple of popular ones. 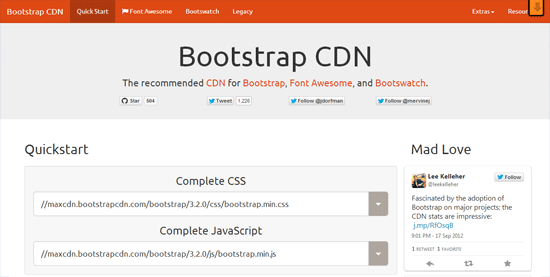 This public CDN can be used to serve Bootstrap core, as well as Font Awesome and Bootswatch. 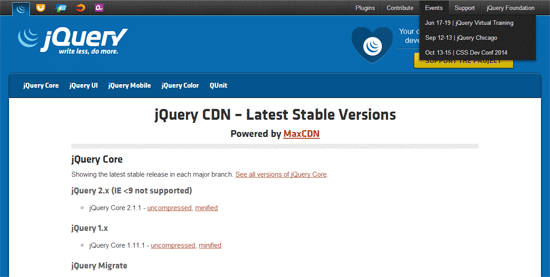 The jQuery project has its own CDN for serving various versions of jQuery and its related projects (jQuery UI, Qunit, etc.). Why Use a Public CDN? Content delivery networks, in general, can reduce your page response times because they are able serve resources from multiple geographic locations, lowering the distance the data has to travel to reach the user. Compared to multipurpose web servers, like the ones used by shared web hosting providers, CDNs also have optimized backend technology specifically for sending out static page resources such as images, JS files, stylesheets, and so forth. 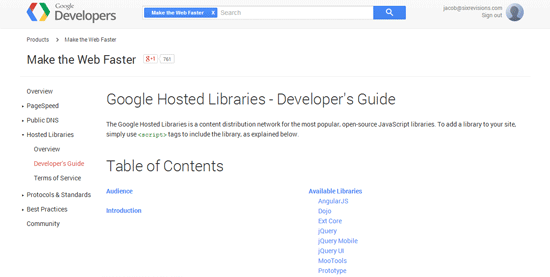 It’s a hassle to upload and update open source libraries on your server. 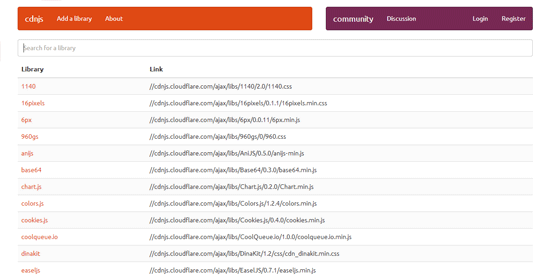 With public CDNs, all you have to do is reference your dependencies and they will just work. And, if you were away on vacation or aren’t keeping up with project updates as much as you should, you have little to worry about because the public CDN will likely update the files they’re serving. The public CDNs in this list are backed by major tech companies, giving you a bit of assurance with regards to their trustworthiness and service performance. Because public CDNs are used by many websites, there’s a bigger chance that the user coming to your site already has a resource stored in their browser, further improving your page response times. In my definition of what a "public CDN" is, the service should have no fees and should be accessible by anyone, just like Gmail or Dropbox.